For many people, air purifier maintenance can seem like a hassle. Remembering to change or clean filters on a regular basis is essential to making most air purifiers work properly. To solve the convenience problem that this presents to some people, Airfree has come up with a line of filterless air purifiers designed to eliminate air purifier maintenance once and for all. One of these units is the Airfree Tulip, a small space air purifier that is an excellent unit for many different uses. The Airfree Tulip covers 450 square feet, making it ideal for small spaces such as bedrooms and offices, as well as for covering smaller apartments. Rather than a filter, the Tulip makes use of a heated core to eliminate various contaminants from the air that passes through it. This core brings the temperature in a very small space within the Airfree Tulip up to 400 degrees Fahrenheit. At this temperature, mold spores, viruses, bacteria, dust, dander and pollen are destroyed, leaving the air clean and free from particulate contaminants. In addition to being a great filterless air purifier, the Airfree Tulip is also designed to be an attractive element of your home decor. 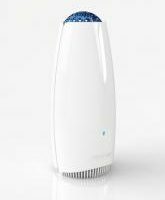 The slim, low-profile air purifier has a modern look topped off with a color-changing light at the top. With this award-winning design, the small Airfree Tulip will fit seamlessly into your decor without drawing undue attention to itself. Who Is the Airfree Tulip Best For? In all of these contexts, the Airfree Tulip presents a convenient option for small space air purification. If you have questions about the Tulip, its uses or whether it would be right for you, please feel free to contact us for answers and personalized recommendations.